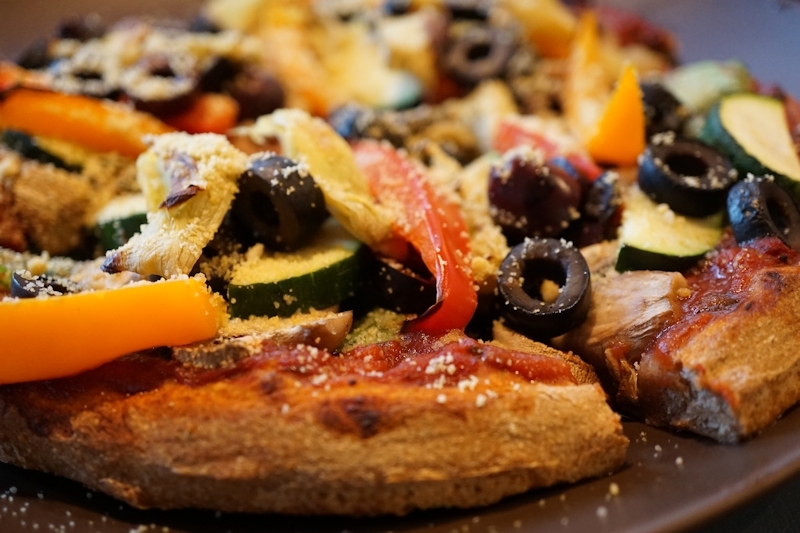 We just LOVE to do make-you-own-pizza nights! Whenever I post photos, I have had several people ask me how we make our pizzas. I found these (set of 2) non-stick personal pizza pans on Amazon.com, and I LOVE them! Since everyone likes something different on their pizza, they can put whatever they like on theirs! Buy a couple of sets and enjoy! I'd love your pizza recipe! Right now, we just buy Trader Joe's whole wheat pizza dough and form it on the pans. Then, I make either a fresh marinara or pesto sauce for the base, add veggies, and bake -- topping it with our homemade parmesan. However, I am going to try the whole grain dough in the PlantPure Nation cookbook soon! How many personal pizzas does the dough from Trader Joe's make? Thank you! 2-4, depending on how thin you want them. The cost is $1.19 for one bag of dough!